At Black Pot Safaris, we only use the best and most reliable vehicles for our safaris. Your safety and comfort are our main concern and we used to only recommend the Land Rover Defender for our trips. Unfortunately since Land Rover ceased production of the Defender in 2016, we now hire from the Toyota 4x4 range for our clients. Times have changed! Our Toyota 4x4 vehicles are sourced from a leading provider in South Africa and we ensure they are fully serviced before your safari. Each vehicle is air conditioned and supplied with all the necessary equipment. So, if you are serious about your African safari and game viewing then a Land Cruiser is essential. 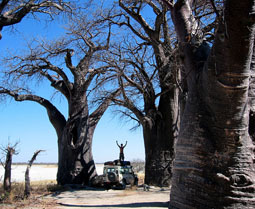 Especially as many of the most scenic areas and finest game reserves are only accessible by gravel roads or 4x4 tracks. Toyota has achieved legendary status in Africa and the Land Cruiser is synonymous with the unparalleled exploration and adventure that this magnificent continent boasts.